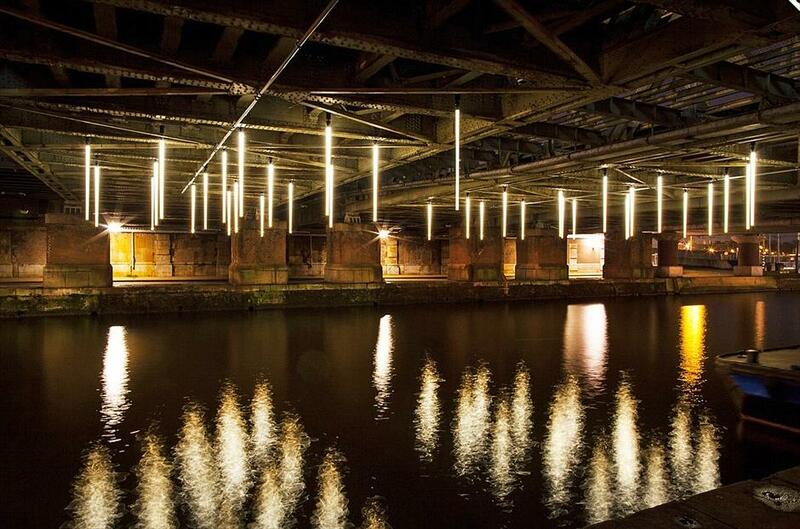 On the last day of the Amsterdam Light Festival 2014/15, the lighting installation ‘Hang in there (you will be fine)’ was unveiled. 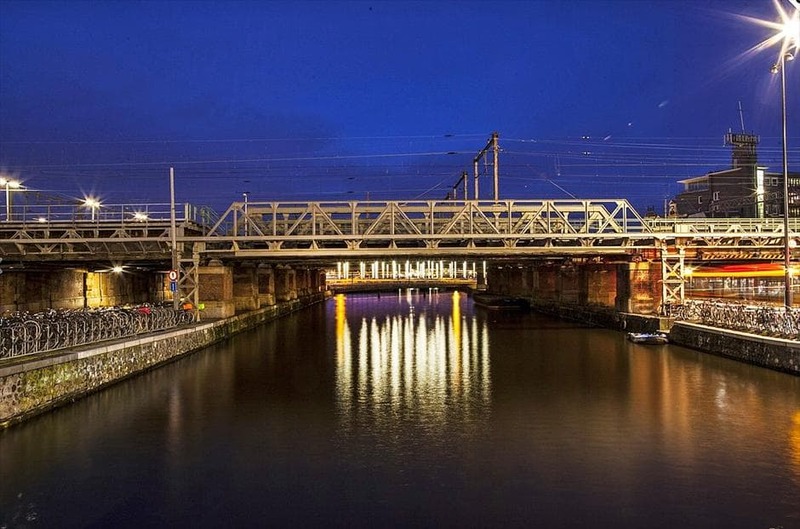 ‘Hang in there’ – commissioned by the Service Traffic and Transportation, and designed by the agency ‘Illuminate’ – is a permanent installation that will light one of the underpasses of the Central Station. 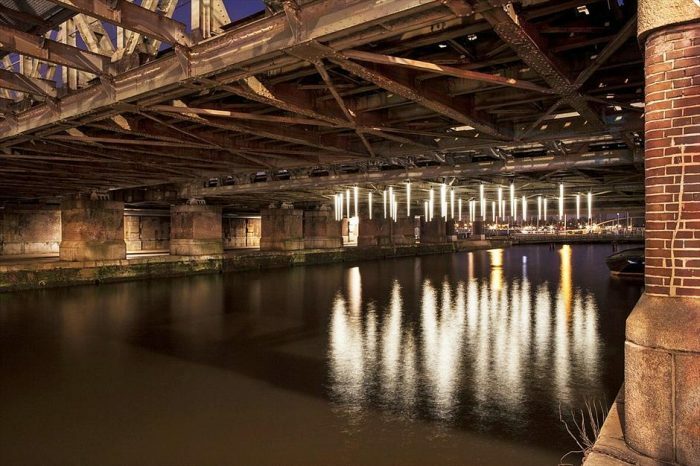 Jasper Klinkhamer and Matthijs ten Berge of ‘Illuminate’, so expressed their view on the aesthetic and social value of the new artwork: “The spot above the water between the new concrete bridge and the old steel bridges is currently a no man’s land. The underpass also can somewhat hurt the senses due to the huge roar of the passing trains, the humidity and the dark water. No better place for an installation like this: transparent, light, slim and fine. The contrast is confronting. Hence the title.” Every day thousands of cyclists and pedestrians use this passage; the artwork will improve their perception in that dark and noisy environment. 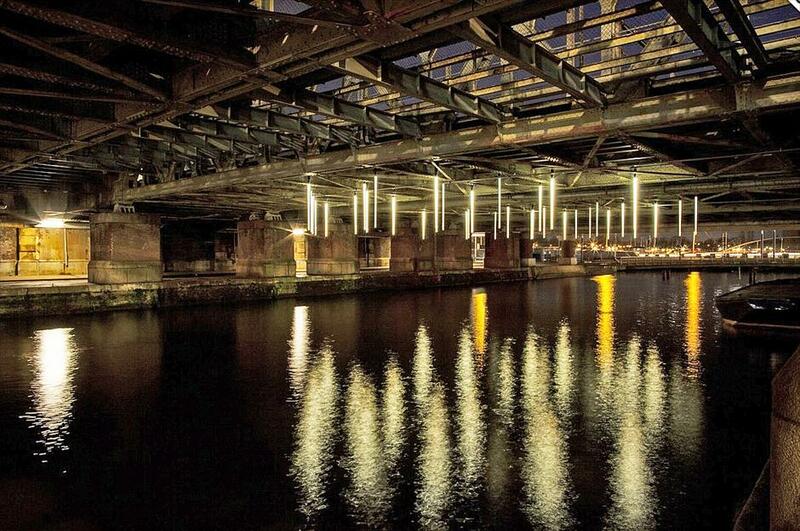 The lighting installation consists of 36 transparent tubes mounted under the railway bridge above the water. The tubes are lit from the inside by FOCUS Warm White compact LED projectors, controlled by Z60 Series Suppliers/Controllers. The special fixtures for this artwork were developed by DTS in collaboration with Full AVL, upon request of Lichtpunt Theatertechniek.